I absolutely love cooking. I have for as long as I can remember. I remember sitting in our kitchen and periodically looking up from my Gameboy to watch my mom (or dad) tossing ingredients together - curries, pasta dishes, mexican food and more. For me, watching someone has always been the best way to learn. Learning from a lecture or class seems so theoretical: "Here's what you need to do. Just trust me on it." But if you can watch someone who knows what they're doing and see the success (or taste the deliciousness)? Then you know that something will work. This article will serve as your grandmother in the kitchen. 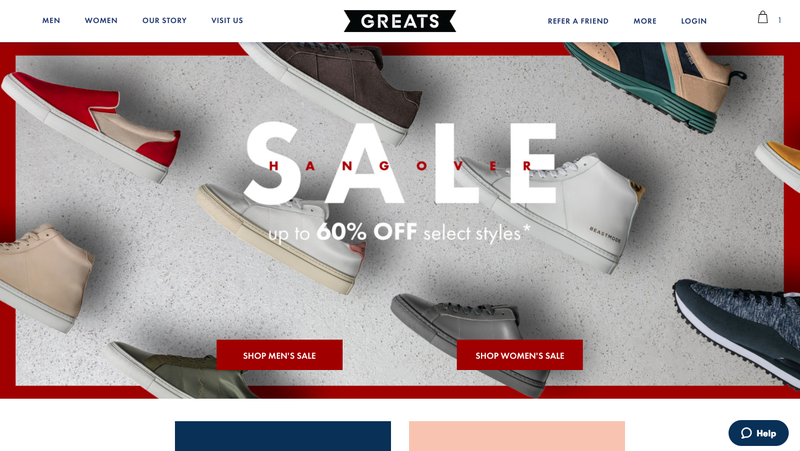 I'll break down the 8 most-impactful website additions that ecommerce company Greats Shoes uses to boost sales. A welcome overlay, like the one below, frames the buying experience. Firstly, it provides your business with a visitor's email address. This is huge, as it means that if they don't complete a purchase (which about 95% of them don't, statistically) you have a second chance to convert them via email. Secondly, it makes your visitors look at every product in your directory and, in their head, take 10% off of it. This cost-saving experience is worth far more than just the 10%. It makes them say "Ooh, that's expensive. Though I do have that discount…"
Both an email and a text option for lead information submission: This is huge, and (while more difficult) would massively increase conversion rate. Luckily, Wishpond has an integration with SMS software Twilio that enables automated text messaging. 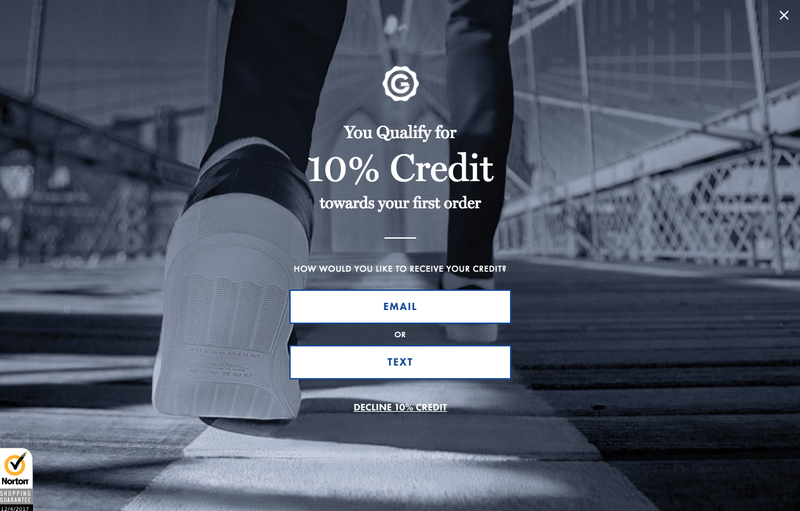 "Decline 10% credit:" This is what we call a negative CTA (which would close the overlay). When Copyhackers introduced the "opt-out" call to action their blog subscription skyrocketed by over 500%. Pronouns: Using "You" and "Your" in the messaging subtly communicates that the discount is personal to the viewer. Emphasized value: This is design 101. If you want something to stand out (like the value of your offer) make it larger than the copy around it. Trust symbol: See that Norton checkmark at the bottom left. That's what we call a trust symbol - a third-party symbol of validation. There are a few critical stages within the ecommerce checkout process: the homepage, the directory, the product page and the checkout page, or pages. The product page, though, is where the magic happens. This is where you truly sell someone on your product. Ensure you have a large, high-resolution product image. Then test whether your visitors respond better to your products just as they are, or if completed purchases increase if you use a model. Keep information succinct and clear. Then test an "expand" option with more information which only shows when someone clicks on a link or button. Provide third-party validation, both with trust symbols and customer reviews. Then test if people respond as much to "stars" as they do full testimonials, or if having both is best. Check out my complete breakdown of this product page in "How to Get More Sales from your Ecommerce Product Page." A great way to optimize your ecommerce website is to draw your visitor's attention to a promotion you're running. 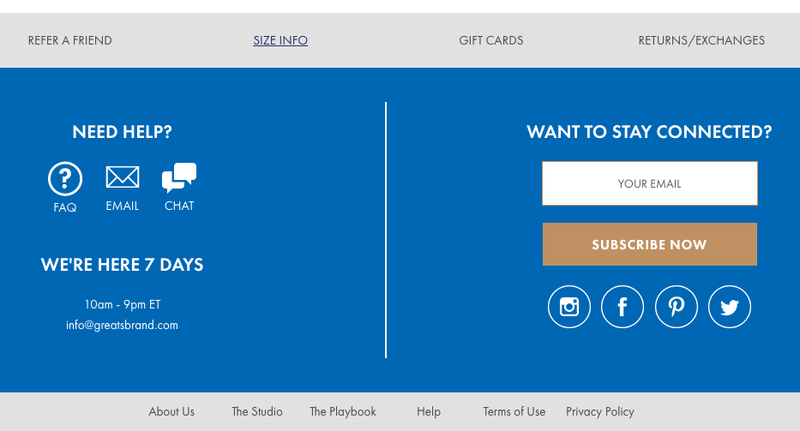 A great way to do this is to add a sidebar scrolling call-to-action, like Greats did on their homepage. This kind of website addition - something which stands out n terms of design (the angled lines provides a subtle directional cue) - is super simple to add, but could be a serious game-changer. Email submission to get a discount or free shipping: "Want Free Shipping on your First Purchase? Click here to learn more!" (By the way, I'd recommend coupling the sidebar scroll popup with a click popup if you're going to go this route). Sale notification: "Now until January 31st, Buy-One-Get-One-Free on all women's purses! Click here to learn more!" Segmentation: "Interested in shopping the children's department? Click here to head straight there." What makes that sidebar scroll popup even more impactful is that it doesn't send people back to the product directory. This is personalization. It's giving your visitors an experience of their own - rather than the canned experience everyone else gets. If they've been given a 10% discount, the rest of their website experience should remind them of that fact. 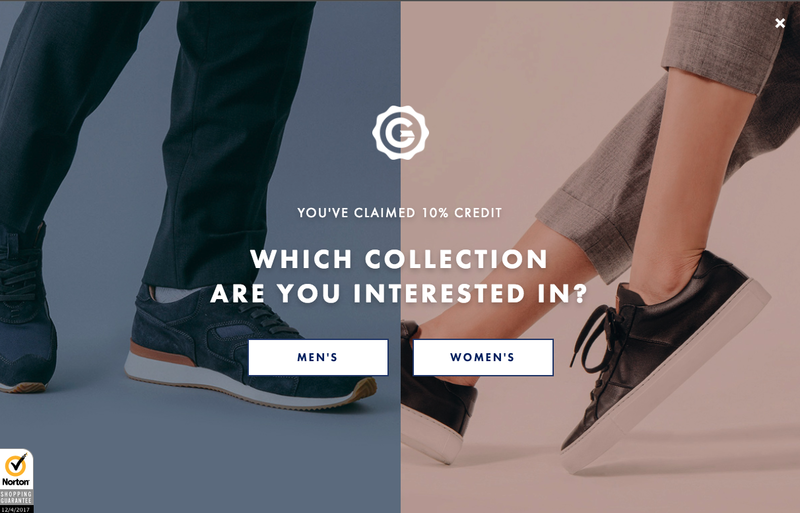 As soon as they arrive on your homepage, ask your website visitors if they're interested in shopping for men or women. If they click "women," send them to a product directory which doesn't have products or men or children. Then, when they're creating their account upon checkout, pre-populate the "gender" field with "woman." If you'd like to talk to a marketing expert about how to implement the strategy I recommend above, feel free to book a time to talk. Tell them James sent you. For most ecommerce websites, your homepage is the most frequently-visited page in your website. Although you should be sending specific ad or social media traffic to designated landing pages, you're still going to get more eyes on your homepage than anywhere else. So why are you keeping it generic? Your homepage should feature a clear and specific reason to buy today. Not tomorrow or next week, but right now, on this visit. Don't have an in-house design team? A great hack to get around the need for a designer is to use a Wishpond welcome overlay on your homepage, which would accomplish the exact same thing as a temporary header, but enables you to use templates which professional designers have created. Adding urgency (either through a scarcity of resources, like Greats has, or through a scarcity of time, as many airlines do) is a powerful motivator. People are lazy. Think about it, you either buy something because you need it (in which case you care less about the money than normal) or because you don't need it, but the price is right or the thing isn't going to be available later. The use of urgency to drive website optimization has frequently shown to boost sales by up to 300%. I added something to the Greats shopping cart as an experiment. I wanted to see how their website would respond to me trying to abandon it. Interestingly, very little happened when I tried to leave. Firstly, I love "Your cart is not reserved." It implies to me that I could lose whatever I put in it. And, unconsciously, that's not something anybody wants. It entices me to take steps to reserve (or buy) the thing I wanted. This header bar scrolls with me as I navigate Greats' homepage, meaning it's always visible, and (with that great messaging) eating away at my ease. I want to take action. Two, both positive, CTAs. Because the website can still be navigated, Greats has gone the faintly aggressive route and made both buttons on this scrolling header bar send me to checkout. This is not an option you can make with a popup which covers the screen and stops people from being able to navigate your website. 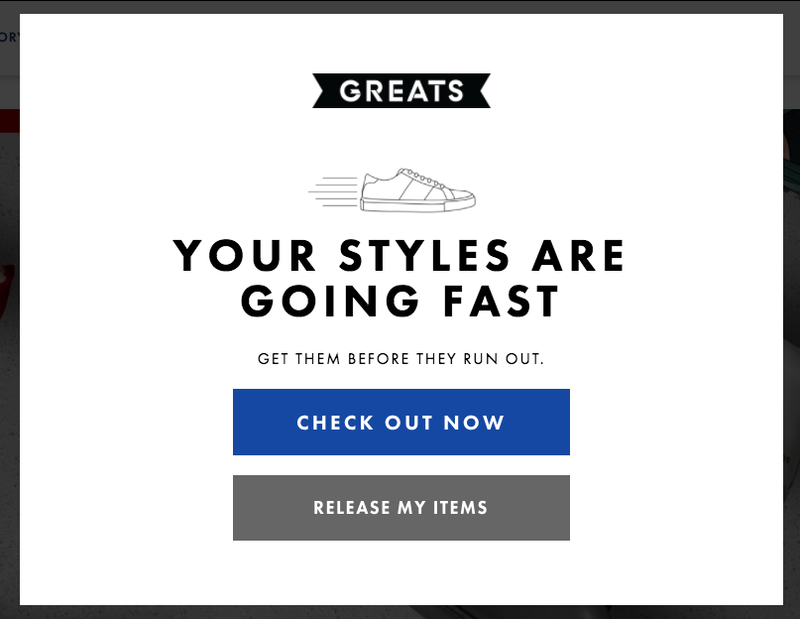 I love the copy "your styles." This implies ownership, which unconsciously makes me ascribe more value to what's in my shopping cart. The opt-out copy "release my items." "Release" feels like I'm not letting my chosen products be free. I want to release something which I've contained. A better option (and the one I'd test) would be "Check Out Later" - thereby, subconsciously, making me think I'll come back to finish the purchase later. To get more strategies to reduce ecommerce shopping cart abandonment, check out my article "30 Reliable Ecommerce Marketing Strategies (With Real-World Examples)." I'm not going to get into this one in any big way, but you'll notice that many successful ecommerce businesses are now prompting visitors to opt-in to receive emails. The reason they do this is because it's far better to lose a prospective customer who you have the contact details of than lose one you don't. And, given that 95% of ecommerce website visitors leave without completing a purchase, that's a definite chance. Having an email address enables you to remind people they have something in their cart, that there's a sale they might be interested in, or (once they buy) that they might want to buy again. 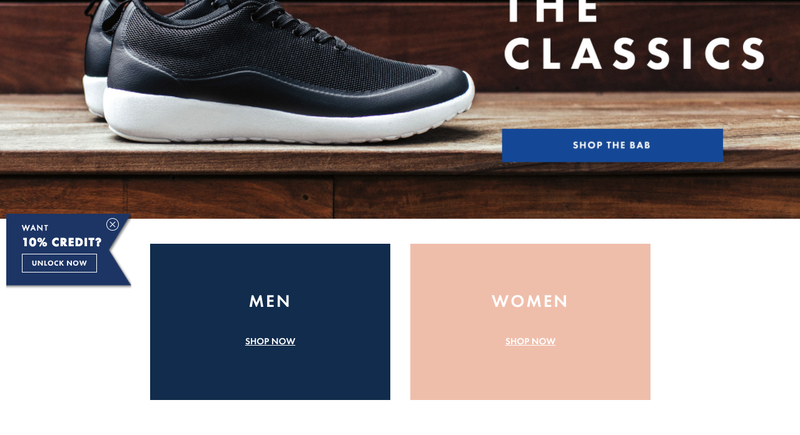 For a full walkthrough of how your ecommerce business can get the most out of email marketing, check out my article "Ecommerce Email Marketing: 7 Examples & Strategies to Drive Sales." Hopefully this article has given you a few ideas for how to optimize your ecommerce website. Focus on incentivizing the purchase today, getting visitors to opt in, and personalizing/framing the experience so people feel taken care of. If you have any questions, don't hesitate to let me know in the comment section!